This is a page on cat health written for children and parents who like straightforward English..
Nowadays you can check a cat’s temperature more easily. Your vet is the person who knows the most about cat health. If you asked him for advice he would not try and teach you everything he knows. There is too much to know and do. He would probably say three things to you. First, he would say that there are things you can do to stop your cat becoming ill. One of these is to make sure that your cat is happy and relaxed in the place where she lives. He would also say that you should check your cat from time to time to make sure that she looks well. This is important because cats are very good at hiding illness. It is easy to miss signs that might tell you that she is ill. You should know your cat well. This allows you to spot something different in your cat’s behavior or the way she looks. If something looks wrong more checks should be made to find out what is happening. Lastly your vet would probably tell you to bring your cat to him as soon as you can if you think your cat is sick. If you wait before going to the vet your cat might become more ill.
On this page I will go over these three topics. If you want to read more there are tons of pages on this website where you can do that. I am sure you want to give your cat the best chance of being in good health. Even when everything you do is right your cat might still become ill. But you can help stop illness. Just like people, a cat’s health can be affected by the place where she is and by the food she eats and the things she does. 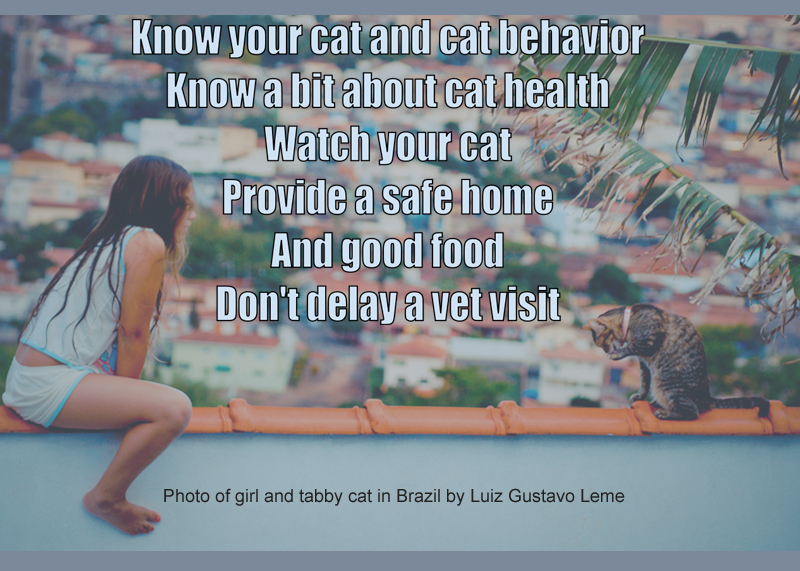 The place where your cat lives should be safe, the food should be suitable for a cat (and cats need special food) and she should have the chance to behave in a way that is normal for her. The most important thing to remember is that your cat is a wild cat at heart. She is tame and friendly but she needs to do the sort of things a wild cat does. If she can do that she will feel good. If she can eat food that is like the sort of food a wild cat eats she will be eating the right food. For a domestic cat the ideal food is a mouse. The nearest you can get to a mouse is the best quality cat food you and your parents can buy. Nowadays people mainly believe that a cat’s usual food should be the wet type of cat food. It is OK to give your cat dry cat food for a while but not all the time. This is because it is not natural enough. If you feed your cat a lot of dry food she will need plenty of fresh water. The problem, though, is that cats don’t drink enough water when they eat dry cat food. If there is more than one cat in the house, more than one bowl of food should be put down as it stops one cat making life difficult for another cat. This helps to stop cats getting stressed. Cats that are stressed can become ill or do things that upset people. A cat should have the chance to play. For a cat, playing is like hunting. Cats should have a place to go to that is safe, quiet and where they can hide if they need to. This is more important if there are other cats in the house. Also if there is more than one cat in your home make sure that there is more than one litter where she can go to the toilet. This is to stop your cat becoming tense because some cats will make other cats feel bad about using one litter tray. Accidents happen in the home to people and to cats. Some stuff that people keep can hurt a cat such as moth balls, car anti-freeze, pain killers for people and chocolate. Also some sorts of plants can hurt a cat if the cat eats the plant. Ask you mom and dad to make sure the plants are safe and to read this page. One of the biggest problems in the home for your cat is that it is made for people to live in, not cats. Make sure the home is safe for your cat. If your cat goes out there are lots of things that can hurt a cat. A cat can have an accident or be attacked by a wild animal or be run over by a car. People sometimes attack other people’s cats because they don’t like cats. If your cat goes out it is important to make sure you know where she goes and that she is safe in those places. Cats don’t understand that some places are dangerous such as roads and other people’s gardens. You should play with your cat but in a way that is safe for both you and your cat. Cats are strong and have sharp claws. Let a cat keep her claws but make sure she does not need to use them on you. You can do this by not playing too hard with her. Or play with a feather on a soft stick. That will keep your hands and arms out of the way. There are some simple things that kids can do to check that their cat is well. First, as I said before, it is important to know your cat. That means knowing how much she usually eats, her normal weight, how much she drinks, when she uses the litter, how much poo and pee she produces and whether it looks alright. That means getting involved in cleaning her litter tray. The litter should be cleaned daily. Cats wash themselves all the time. But it is useful if you comb her fur with a fine comb called a flea comb. If she has thick and long fur this is difficult and it takes time. Gentleness is important when combing a cat. Cat fleas are a common cat health problem so checking for fleas daily is a good thing. Also combing with a flea comb means you get to know her coat and skin better. You can spot problems. Another common cat illness is that some cats become allergic to the flea bite. “Allergic” means that the cat’s body reacts in a bad way to something. A cat that is allergic to the flea bite will have an itchy skin. She will scratch her skin and lick it a lot. Another big health problem for cats is their mouth, particularly their gums. When your cat yawns have a quick look at her teeth and gums. If the gums look red she may have sore gums. If that is the case her teeth need cleaning by a vet. If your cat drools (saliva falls from the mouth) it means she has a very sore mouth. You should take her to the vet as soon as possible. Cats often throw up – “vomit”. It might be because she wants to get rid of the fur she has eaten when licking herself. This is normal. It is also normal for a cat to throw up food that is not nice. But if your cat throws up a lot you should take her to the vet quickly as it is not normal. This is a good example of checking your cat. It is about deciding what is normal for a cat and what is not normal and then finding out why she is doing things that are not normal. A vet can do that. It is called “diagnosis”. One thing you can definitely do if you think you cat might be feeling ill, is to check her temperature. If for example she has a cold or the flu (runny eyes and nose), there are easy to use machines these days to check her temperature. 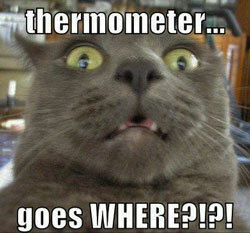 They are called “Pet-Temp Thermometers”. 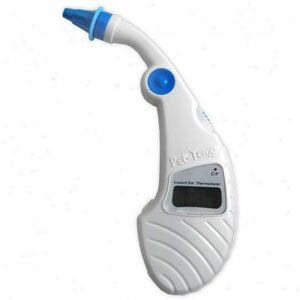 All you do is gently place the machine in the ear of your cat and it measures her body temperature. The temperature should be between 100.4°F and 102.5°F. If your cat’s temperature is high at 103°F to 104.5°F you might phone your vet for advice. If at 105°F take your cat to the vet quickly. “F” stands for Fahrenheit. Poop is watery and not solid. The possible causes are: bad food, milk for humans, stress and a small creature that lives inside the cat called a “parasite” that looks like a worm. A problem with the part of her insides that lets her pee. Very small creatures can live inside that area and cause problems like peeing too much. There may be blood in it as well. Cat Flu – your cat has the sort problems that you have when you have a cold or the flu. It is caused by a very, very small creature living inside your cat called a “virus”. Throwing up. Called “vomiting”. It is only a problem if it happens a lot. The cause may be complicated and may be simple. A vet will tell you. Too much sugar in the cat’s blood. This is called “diabetes”. If your cat eats more and then less and pees too much and also starts to look thin, take her to the vet. Itchy skin. This is sometimes caused by the cat’s body reacting to something in a bad way. As I said, one reason is being bitten by a cat flea. There are lots of other things that can cause this. Your cat will scratch her skin. Your cat can’t poop! This is called “constipation”. You’ll need to check the litter tray. Small creatures living in your cat’s ears. These creatures are called “parasites”. Your cat will feel bad and shake her head and scratch inside her ears. Your cat eats tons of food but looks thin. This might be caused by a part of the insides of her body near her throat going wrong. It is serious and a vet is needed. It is called “thyroid cancer”. I don’t like going to a vet. I get nervous. My cat is nervous. We are worried. But sometimes only a vet can help your cat. You have to know when you need to take her to the vet and then take her without delay. This page should help you to know when to take your cat to the vet. If you wait too long it may hurt your cat. It is not sensible to try and fix problems yourself. Original Picture of girl and cat on Flickr. All that children need to know about cat health is on this page. If they could stick to these guidelines cats would be healthier. People don’t need to know a lot about cat health. All they need to know is when something is wrong and when to take their cat to the vet. Great post. Here is another link for helping ease cats stress to visit the veterinarian. Thanks for visiting Dr. Francis. It is nice of you. I’d really like you now to begin next week by refusing to declaw cats for non-therapeutic purposes. You’ll feel really good about it.